(Well, subtract a few of those, and you’d have a more accurate impression of what we were working with). We sold our first house for a profit, and we had saved up a fair but, but still. We were a young couple with two small kids, and we were determined to build a DIY house that didn’t put us in debt. We accomplished our goal, but it meant that we skimped wherever we could. We took one look at granite prices (the hot counter surface at that moment) and went, “Nope.” Do I love our tiled counter tops? Again. Nope. But they saved us thousands of dollars. Did I love making multiple trips (sometimes a day) to Lowe’s to get the best deal on every last appliance and light with two babies in tow? Eh, in some ways I didn’t mind too much because it was my primary contribution to the process (when Shaun was doing 99% of the actual build). But it got tedious and stressful after a while for sure. Did I end up with some mirrors and sinks that I didn’t love just because they were a smokin’ hot deal? Of course. There’s nothing wrong with ANY of this. I’m not complaining. I’m so stinkin’ grateful we got to build a custom house debt free more than less how we wanted it that I can’t even express it adequately. This time around, it’s not our first rodeo. And we’re not on a time crunch (which is huge). So many of the budget-driven decisions I made were fine with me because I didn’t know who I was design-wise. I mean, sure, I thought I knew what I liked. But…after repainting half of the rooms in our house over the last 8 years, I’ve discovered something: I don’t like colored walls as much as I thought I did. Maybe an accent here or there. But mostly I prefer neutral with (sometimes lots of) pops of color. Again, nothing wrong with this. I will never be the girl that says it REALLY matters (in an eternal way) what your house looks like or whether you love everything from the soap dish to the sconce in the guest bathroom. But it sure does make it easier to know exactly what you’re looking for instead of mentally shrugging and feeling like you could be making a big mistake. Because you don’t want to spend any amount on something and then realize 6 months later that you actually kind of despise it. So, this time around, I’m happy to announce that I know what I like, and while–true to my bargain-loving self–I will scrape for every last deal I can score, I’m also enjoying giving myself a bit of freedom to plan, play, and maaaaaybe even splurge on something I absolutely love. Which brings me to maybe the most expensive room in the house (after the kitchen, of course): The Master Bathroom. 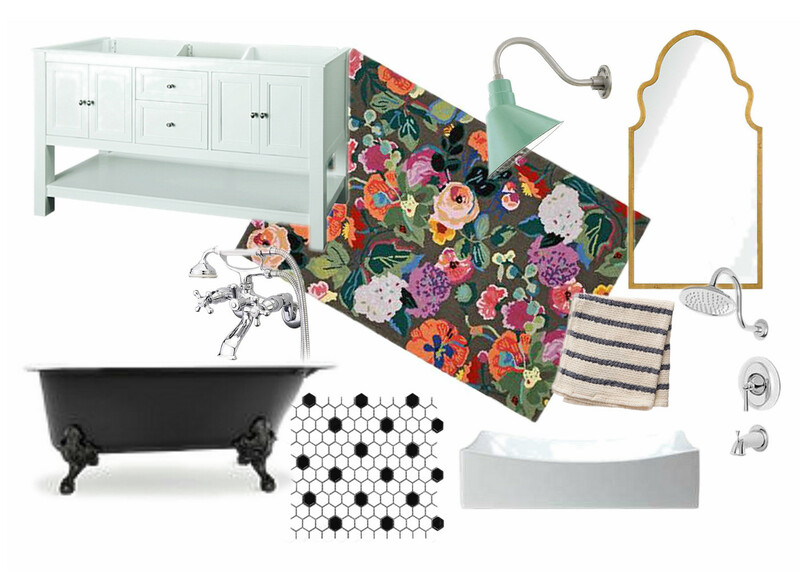 Using my trusty Olioboard program, I whipped up a mash up of most of these elements to create my dream master bath. Something I’ve discovered: I don’t mind mixing metals. Gold with silver. Chrome with matte. Even bronze with something brighter. As long as the mix ends up looking eclectic rather than jarring. And, yes, that clawfoot tub is the absolute bomb. So is this AH-mazing Brockway sink . Image via Pinterest. Also, see those oil rubbed bronze sconces with the chrome sink faucets? Totally works, right? But, even if I manage to bite the bullet on that one, it would have to be for a different room in the house than the master bath since we really need storage in there. So…did you notice something missing? 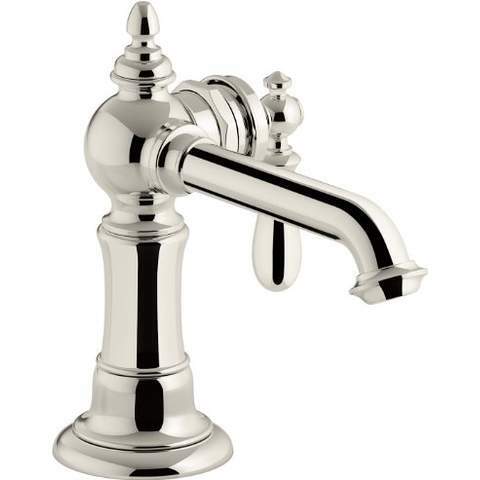 I really like this one from Kingston Brass (I love almost every faucet they make, actually). This guy from Delta is pretty fun too. Oh, and these wall-mounted versions have started catching my eye recently. This last one is pretty similar to the second one, but I miiiight prefer this funky version . Especially the finish. 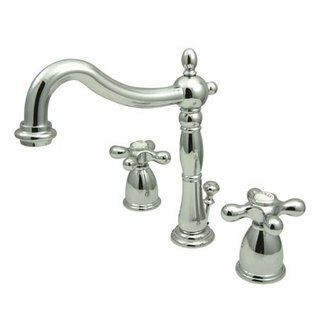 Which faucet do you think best matches the master bathroom (as it appears in my head, at least)? Or maybe you have one you love that you think I should consider? You know I will! I like B or D. Depends on what brand it is. My husband is a plumbing contractor. 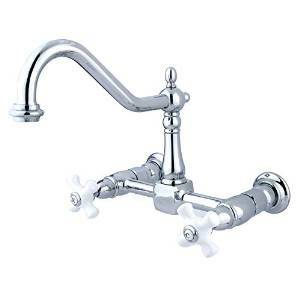 We have a Delta in our master and Moen everything else plumbing related. Although wall mounts are really cool, you can’t see the water lines like you would in a counter mount. IF there is a leak it may not be noticed as quickly as a counter mount or as easy to fix! A note on kitchen sinks, I LOVE my granite composite sink! SO durable! Also, they do make an oversized kitchen double basin sinks that have drain boards on the sides…like what restaurants might have. I personally haven’t seen them, but my husband has a client with one and wants to put one in my kitchen. Good luck with decision making! I vote D, mostly because it is funky and the perfect combination of classic and unique, like most of the things you are planning to incorporate. A & C could be in anyone’s bathroom. A or C wins my vote. The wall mounts look cool, but can become wobbly when used often. Love the idea board! I think mixing metals is actually the way to go in a bathroom with this much style. To me everything bronze or nickel etc looks kinda boring unless you have a super sleek & modern home. I like A or B the best I think. I like your comment about mixing metals. I constantly struggle with this concept in design. I love hearing other people’s thoughts on it! Love them all! But I agree with some of the others that the double handles might be a pain. What if you found one that has lever handles instead of the twist knobs? If A had those, it would be my favorite of the bunch. I think you would be unhappy with B or D. There is no way to adjust the pressure, only the temperature. I have the single handle in my shower and it can only be on or off. I would like to be able to have a low flow, yet have warm water. I would say A or C. They kind of go better with the bathtub and shower faucets. I think all are cute. B is my least favorite. Good luck!! It’s really fun to watch you designing this house. C!!! I love the wall mounted effect. Easier to clean (in my opinion) since you aren’t trying to get behind it on the counter top. But more importantly, it gives you even more counter space! No two handles!!! Was that enough exclamation points? B or D are my faves! But whatever you choose will look great. I don’t personally mind adjusting two knobs for temperature, but if you think that would bother you, maybe choose one of the single handle options…they’re all cute! 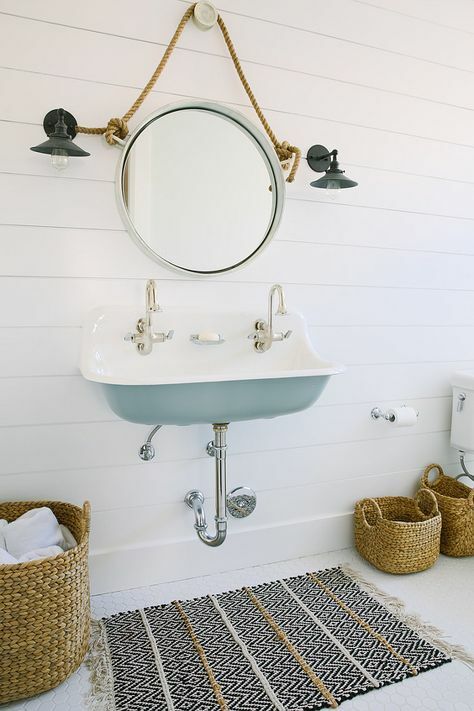 I really like the whole design but am wonderimg about maybe using some of the brassy color from your mirror in the faucets…since you don’t mind mixing metals. Seems like it might it all together. 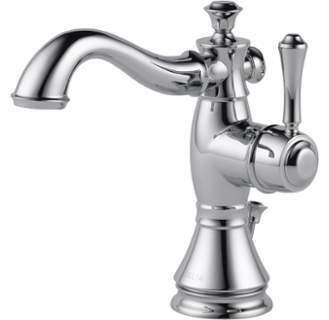 I luuurve Kingston Brass faucets too. We used two in our guest bath reno, and they have been great! 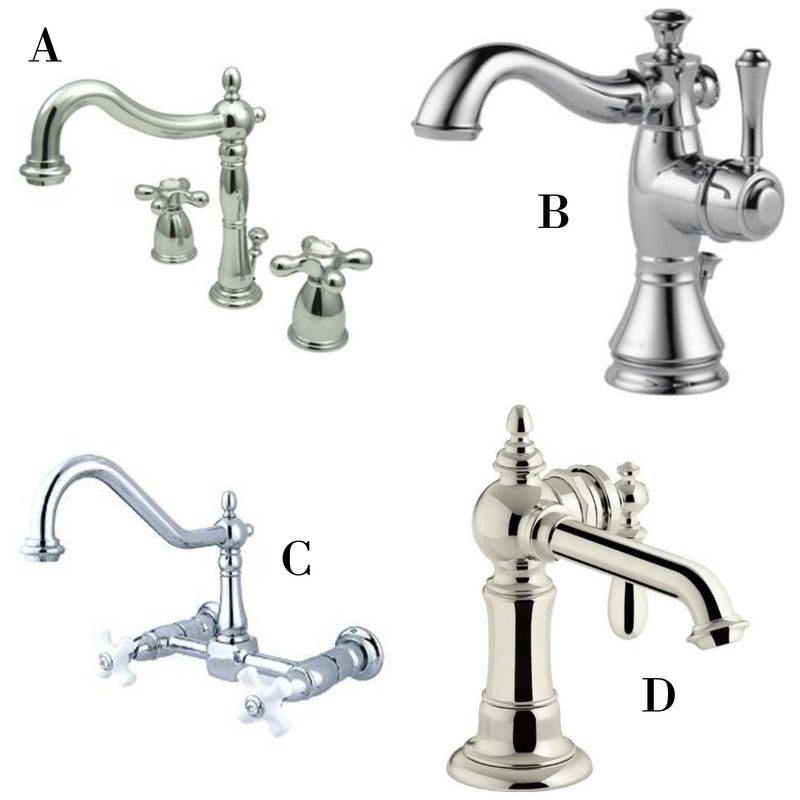 I like them all, but that Kohler one slays me! C looks like it would go best with the decor and style of the other fixtures you showed. Any except the wall mount. If there is ever an issue with it, it would be much more painful to deal with. Plus you can more easily change out the others should your tastes change. Have you checked out print fabrics by Crystal Walen? I think you would like them! My DIL chose a pretty “wild” one (at least to me!) for my Granddaughter’s nursery and it looks great! With your design C. Maybe D.
Leave wall-mounted for the kitchen. I LOVE D( the wall mount one).